In Medium or large saucepan Pour juice of pineapple. Add Brown sugar to taste, 1 to 2 cups--more or less. Mix approximately 1 to 2 Tablespoons cornstarch with a small amount of water till smooth. Heat till it thickens slightly. Prepare Ham: Use a 5lb. ham, boneless or a ham with bone whichever preferred. Place in a baking dish or roaster. Cut deep slits into ham. 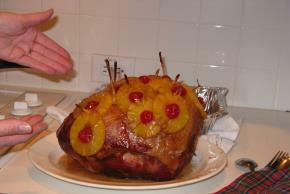 Place pineapple slices and Maraschino cherries on ham, using toothpicks to hold in place. When glaze has thickened, Using baster, baste ham throughly. Cook ham according to directions usually listed on ham packaging. Baste ham with remaining glaze about every 20 to 30 min. until done.